Thursday, May 25th at 17:00, we opened the doors to the Plastic Era Expo, welcoming visitors to discover the hidden world of plastic recycling. It was an amazing afternoon, filled with people, conversation, learning and knowledge sharing around plastic realities, problems and possibilities. After, the Expo remained open throughout June 26th. For pictures of the event, please visit the Facebook album. Our society has a massive addiction to plastic. And it makes sense; it is a remarkable material, but our current make-take-waste economy is a complex problem challenging communities worldwide. We created the Plastic Era Expo to show how we can turn our addiction into something positive through more local, circular plastic disposal and production. The Plastic Era Expo showcased a diversity of recycled plastic products made in the Netherlands, showing the potential plastic holds as a durable material that can be used and reused and reused – if we harness its value as a renewable resource. As visitors explore the Expo, an organized information system allows them to learn which type of plastic recyclate was used to make each product. In fact, everything visitors saw and touched at the Expo was made from recycled plastic, with great thanks to our main partner NRK Recycling; contributing partners Interface and Urban Mining; and featured designers Dirk vander Kooij, Better Future Factory, UrbnGds, Waste 4me2, and WASTED Block designers Alessandro Iadarola and Bob Vos. For the opening, we were honored to welcome Dave Hakkens’ traveling Precious Plastic lab. There’s a good chance you’ve seen Dave’s video about developing small-scale, DIY plastic recycling machines. This offered a chance to try them. Precious Plastic expert Mattia was be on the scene offering free Precious Plastic workshops, welcoming visitors to learn how to extrude, thermo press, injection mold and more. 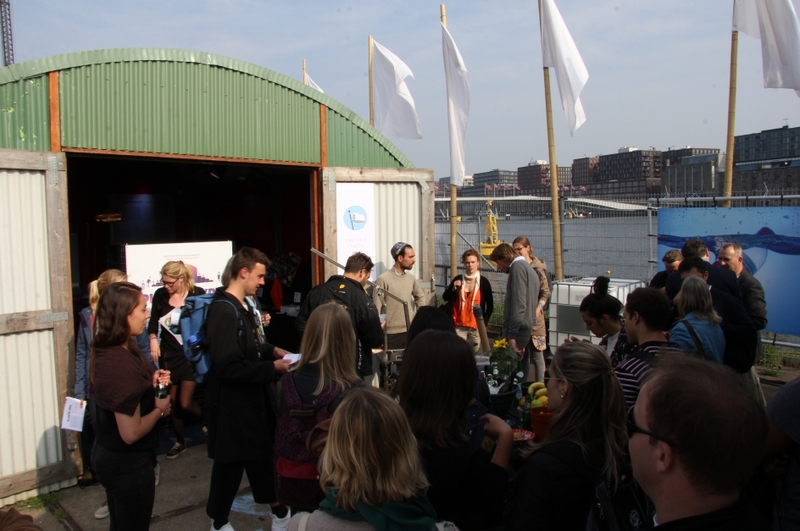 The Plastic Era Expo was situated on FabCity Campus, located on Kop Java Eiland just off Amsterdam’s eastern shoreline. FabCity is part of the official Arts & Design program of the Dutch Presidency of the European Union. We organized the Plastic Era Expo to advancing more sustainable behavior and conscious consumption, driven by exposure to the possibilities hidden in the mysterious world of plastic recycling.